A vital regulator of basic health, magnesium is an essential cofactor required in over 300 enzymatic reactions. Magnesium is necessary for the biological function of numerous metabolic pathways, including energy production, mineral balance and synthesis of RNA and DNA. As well, magnesium plays a role in protein synthesis, muscle contraction, nerve function, blood glucose control, cardiac excitability and blood pressure regulation. It is the fourth most common macro-mineral in the human body after calcium, sodium and potassium, all of which are essential for the delicate balance necessary for cellular communication, homeostasis and optimal health. Much of the magnesium stored in the body resides in the bone, followed by muscle and soft tissue, with less than one percent found in blood serum. In fact, the cells of a healthy heart may contain as much as ten times the amount found in the blood. This mighty mineral influences normal neurological function, the release of neurotransmitters, ATP metabolism and muscle contraction and relaxation. It is a required element for enzyme stabilization, glucose utilization and the synthesis of fats, proteins, nucleic acids and coenzymes. Magnesium’s role in the healthy balance, or homeostasis, of important electrolytes affects the conduction of nerve impulses, muscle contractions and heart rhythms. Magnesium deficiency is a common and widespread cause of everyday mental and physical health problems and has been found to be an important determinant in the widespread epidemic of chronic disease. According to the World Health Organization (WHO), as much as 75 percent of American adults do not meet the USDA daily recommended magnesium intake of 420 mg. The symptoms of magnesium deficiency are subtle, unless levels are severely low. Per the National Institutes of Health (NIH), low intake of magnesium is the most common mineral deficiency in the U.S. Yet, surprisingly, magnesium deficiency is an often overlooked health issue. Deficiency can result in fatigue, sleep disturbances, irregular heartbeat and muscle cramps, twitches, and weakness, as well as increased risk of depression, osteoporosis, heart disease and high blood pressure. Diminished levels of dietary magnesium in many processed and some nonorganic foods. Common staples of the American diet, such as meat, sugar and refined white flour contribute less than 20 percent of the daily requirement. 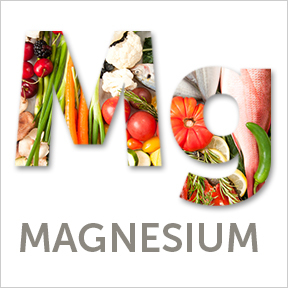 Cooking and boiling of produce results in a significant decline of magnesium content. Reduced absorption resulting from gastrointestinal disorders such as Crohn’s or celiac disease. Many widely used medications reduce magnesium levels, including antibiotics, antacids, antihistamines and diuretics, as well as blood pressure and cardiac medications. Excess excretion of magnesium with alcohol use. Commonly used pesticides, which potentially decrease magnesium content in soil and crops. Normal aging that can decrease magnesium absorption by as much as 30 percent. Chronic low intake as a result of poor food choices, including increased processed foods, reduced whole foods and demineralized water. As magnesium is a known modulator of calcium, supplementing with calcium can lead to magnesium deficiency. This is because both minerals compete for entrance into cells, affecting cellular process balance. Increased perspiration due to physical activity, heat or humidity, resulting in mineral loss. Smoking, which depletes essential vitamins and minerals, as well as increases free radical cellular damage. Adding more mineral-rich whole foods to the daily diet, including green vegetables, nuts, seeds and unprocessed cereals and grains, can help to ensure adequate magnesium levels. Legumes, fruits, meats and fish, as well as antioxidant-rich raw vegetables and greens, are good dietary sources. As a macro-mineral, magnesium is essential for life and is required in relatively large amounts. Supplementing with magnesium is often indicated for those who are physically active, those known to have nutrient absorption issues and underlying health conditions, as well as individuals over 60 years of age. As deficiency affects calcium metabolism and hormones that regulate calcium, magnesium sufficiency may help improve bone mineral density and help prevent osteoporosis. Increasing dietary magnesium may positively influence insulin sensitivity, thereby also helping to control blood glucose levels. Magnesium Balance by Professional Supplement Center®: This proprietary formula provides a blend of patented Albion® TRAACS® magnesium lysinate glycinate and chelated di-magnesium malate for enhanced absorption. Malic acid from di-magnesium malate supports energy production, as well antioxidant enzymes. Together these forms of magnesium support cardiovascular and bone health, healthy muscle function, nerve conduction and glucose metabolism. Free of wheat, gluten, corn, yeast, soy, animal and dairy products, fish, shellfish, peanuts, tree nuts, eggs and artificial colors, sweeteners and preservatives. Non-GMO vegetarian formulation. Magnesium Glycinate by Pure Encapsulations®: This hypoallergenic formula provides a highly bioavailable form of magnesium chelate in support of carbohydrate, amino acid and fat metabolism, energy production, cardiac health and enzyme activation. Gluten and soy free, Non-GMO vegan formulation. Magnesium Malate by Designs for Health®: This professional formula provides bioavailable magnesium as magnesium malate in support of enzymatic processes, energy production and magnesium sufficiency. Gluten free, Non-GMO formulation. This entry was posted in Home and tagged Magnesium Balance by Professional Supplement Center, Magnesium Glycinate by Pure Encapsulations, Magnesium Malate by Designs for Health, Magnesium Roles Defined. Bookmark the permalink.